The Maynard boys' basketball team finally broke through Saturday night. Scratch that, the town of Maynard broke through. After watching its basketball team came up short of a state title in boys' basketball last March, and fall in a football state championship game in December, this year's Tigers hoops squad delivered a championship to the tiny town. 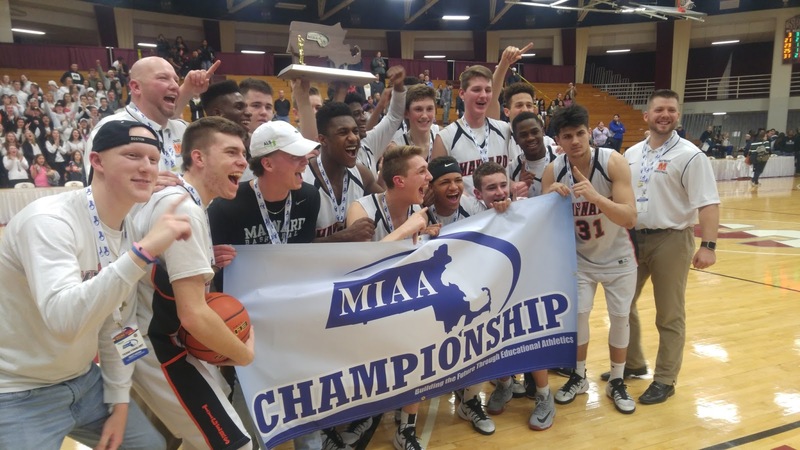 "I feel like the town of Maynard got a chance to get the gold ring, and I was so happy for the town," Maynard coach Paul Howes said. "I don't feel like it's about (us). Obviously, I'm happy for my players, but I'm really happy for the community." The win also served as revenge, as Maynard defeated the same St. Mary's team that had defeated it on this same floor at Blake Arena in Springfield a year ago. Unlike last year, where an inexperienced Tiger team struggled to gain its footing, this year Maynard left no doubt, leading from start to finish in a 62-42 route. "It's the best feeling in the world right now," senior forward Eric Kiley said of winning a state title in his final game at Maynard. "I needed at least one (state championship). At least one." Leading the way for the Tigers, in his final high school game, was the even-keeled Kiley, who finished with a game-high 21 points. Kiley, who also served as the leader of Maynard's football team as an All-State tight end and linebacker, got most of his points doing the dirty work; crashing the offensive glass and cutting while other players created with the ball in their hands. "Eric (Kiley) is the heart and soul of this team," Howes said. "We play a lot of good teams, and there's nobody tougher." "This was my last game, so I wanted to go out with a bang," Kiley added. The Tigers jumped out to a 28-11 halftime lead, thanks to 10 first half points from Kiley, and some sharp outside shooting by center Matt Geiger. Star junior guard Corey Olivier was held scoreless in the first half, but made his presence known as a distributor and on-ball defender. Still, Olivier couldn't be kept out of the points column for long, as he buried a three out of intermission to put Maynard up 19, then finished a fast break to push the Tiger lead to 23. "It means a lot," Olivier said. "We're gonna go party now with our town. Let's go." Even after a 10-0 St. Mary's run, the Spartans still trailed by 17 in the fourth quarter, and Olivier buried another three to end the run. By the time Kiley scored an up-and-under layup with three minutes left, the game was well out of reach, as Maynard pushed its advantage back to as much as 22 in the fourth. After the game, coach Howes praised St. Mary's, and said beating the Spartans made this championship all the sweeter. "St. Mary's I mean, what an athletic program," Howes said. "Hockey, baseball, basketball defending state champs. It just means a lot to be able to beat such a classy organization."